Red, White — It’s All Greek to Me! The weekend winos finally made it to Santorini! Let me first start by saying, what started as a novice adventure into the world of Greek wine turned out to be a really fabulous experience — on multiple fronts. We tasted an array of refreshing whites and some very unusual reds. 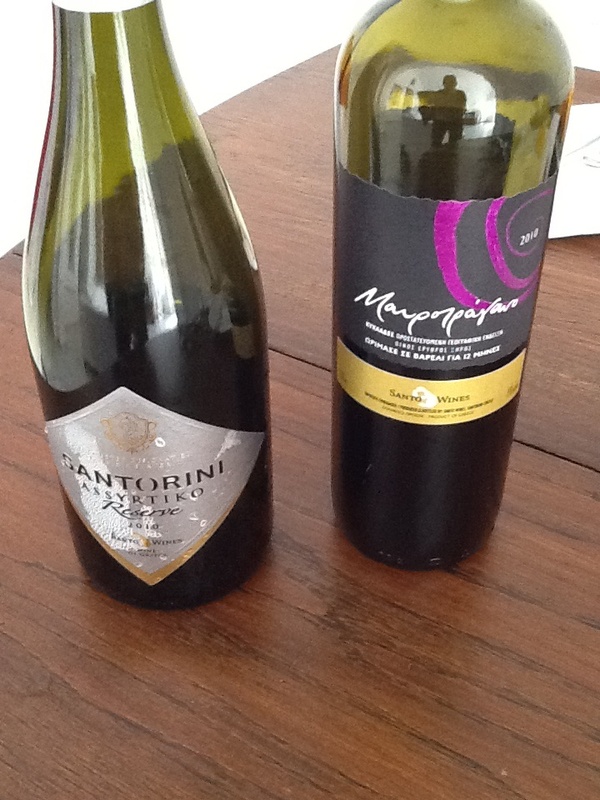 All proved to be quite good and paired wonderfully with the Greek cuisine. Many of our meals incorporated their sweet vin sant (which is typical of the area) into the cooking as well. But let me start from the beginning . . . Truth be told, it was an interview that American journalist Lisa Ling gave several years ago that first caught my interest in Santorini. She stated unequivocally that of all the places she has traveled throughout her career — Oia in Santorini was the most spectacular. I quickly penned a note to myself and years later, finally set sail for a new adventure. Upon our arrival, the locals schooled us in Santorini history and told us that wine was born in the island of Santorini more than 3500 years ago. A few of the oldest vineyards in Europe are here in Santorini, where the vines grow in curls, low to the ground to avoid the strong sea winds. The volcanic soil would lead you to believe that nothing could grow on this terrain, but the Santorinians combine modern technology with tried and true techniques from the past to produce amazingly good quality wines. Wine tours can be easily organized and the wineries are extremely welcoming. It is openly acknowledged that the Greek wines are quite difficult for foreigners to learn about, given the language and alphabet barrier. The grapes have different names like assyrtiko, aidani and athiri. Since the language was not recognizable, we found ourselves at the mercy of our various hosts’ recommendations regarding which wines would pair best with our selected meals. Despite the various challenges, we unquestionably had one of the most memorable experiences of our lives. The town of Oia is charming with many art galleries and some fantastic jewelry. There’s only one word to sum it up — WOW! If you can swing it, definitely splurge and book one of the Canaves Oia Suites (preferably the one with its own infinity pool!) and you will experience one of the most serene and tranquil time of your life. 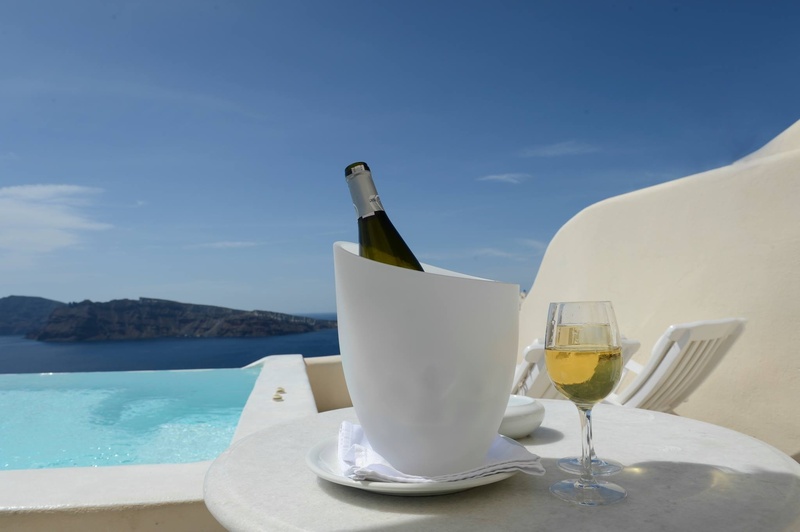 They provided us a refreshing bottle of white Assyrtiko Santorini in our room upon check-in, which definitely kicked off the experience! Known for its fabulous sunsets, the town can get flooded with tours buses from time to time — but go for a stroll prior to 9 am and you will have a very different experience and discover an entirely different town. Both the crowded and serene versions of the town are incredibly enjoyable though. The buzz is exciting and the merchants are all welcoming — then when everything is closed, it’s something straight out of a quaint date movie. Volcanic rock lines the streets and hundreds of steps will entice you to explore. From the famous windmill to the taverns down by the sea, it is nothing short of a piece of paradise. Weather-wise, It was hot — even in mid September. The sun is so bright it is blinding, so this is the perfect time to sit back and enjoy the white wines —many similar to Chablis — and wonder how such beauty resulted from a volcano eruption. Most of the weekend winos were just delighted to have experienced Oia; I am genuinely energized to learn more about Greek wines, in hope that when I return I will retain my appreciation and interest in these wines that are difficult to find, but worthy of the search! Categories: Travel, Wine | Tags: Greece, Greek wine, Lisa Ling, Oia, Santorini, Volcanic soil, wine | Permalink.